It’s going to take me a while to figure out what the Instant Pot is actually good for. 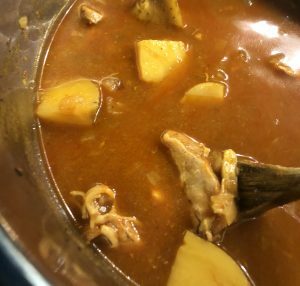 For example, this chicken and potato curry isn’t really any faster doing it this way than on the stovetop — you need the same time sautéing, then the time for preheating and pressure cooking, then you need to remove the chicken and potatoes and cook down the sauce, ideally. I think the only time I’d maybe do this is if I wanted to do the first step in the morning before work, set a timer, and then have it pressure cook the rest when I got home (or just before I got home)? Although I don’t love the idea of uncooked chicken sitting all day at room temperature. Do steps 1 and 2 in the morning, let it keep warm ’til you get home, and then do step 3? That’s a lot of morning cooking time. Just do step 1 in the morning, so you’re ready to quickly cook it when you get home? But you’re still looking at 30-45 minutes then, so….? 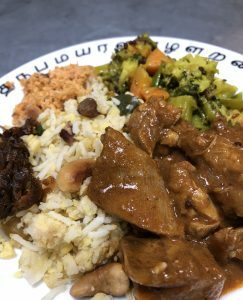 This is the classic Sri Lankan chicken dish; if you were just going to make one, this should be the one. 1. 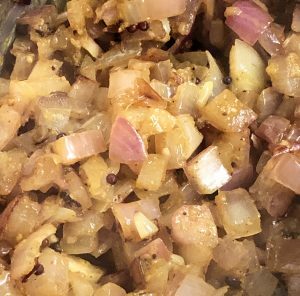 In the Instant Pot, sauté onions in oil on medium-high with mustard seed and cumin seed, cloves, cardamom pods, and cinnamon pieces, until onions are golden/translucent (not brown). Add chili powder and cook one minute. 2. Add curry powder, chicken, potatoes, ketchup, salt, and water. Pressure cook on high 8 minutes (allowing time for preheat cycle beforehand, about 15-20 minutes). 3. 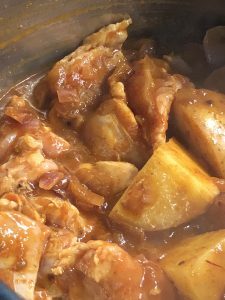 Release steam, open and remove chicken and potatoes to a serving dish. You can serve now, but the sauce will be very liquid. 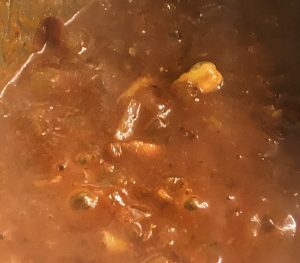 I recommend going back to sauté mode, stirring in lime juice, and simmering it down 10-20 minutes until it’s thickened.